Yes - over 18s only. The place was being overun by unsupervised kids. Go to the other Spoon. only Spoons I've ever been to that doesn't admit families. Barked at by a local when we entered pointing this out. 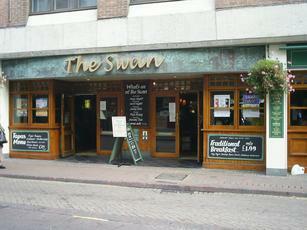 Not as big as most 'Spoons' pubs - which is no bad thing. Maybe that is why the service is quick and efficient. As in the previous post, the food is hotter than with most other outlets. Adnams 'The Publican' was a very tasty beer, the Rudgate Ruby Mild was okay, both still at last year's prices.